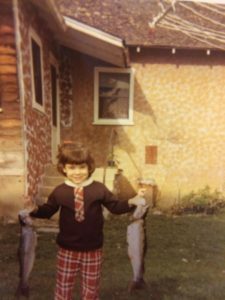 The author as a girl. 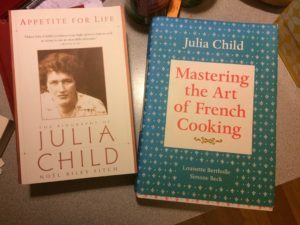 Books by and about Julia Child. Many little girls love princesses and dressing up. I was not one of those little girls. My heroine was not a princess. She was a chef. Her name was Julia Child and I found her talent in the kitchen mesmerizing. I wanted to be just like her. Even into junior high, I had dreams of flying to Paris to go to chef school. As my interests broadened (Anthony Bourdain is my favorite chef and food writer) and my career path shifted, one passion I have continued to hold is my love of cooking. I love making a good meal that satisfies the tastes buds as well as the soul. One of the stories Julia tells in her memoir, My Life in France, is etched in my mind, and raises, for me, what a glorious food experience quintessentially feels like. She and her husband Paul have just arrived in France. It is her first time in the country. They step into Restaurant La Couronne (“The Crown”), built in 1345, in, as Julia writes, “a medieval quarter-timbered house.” Paul orders sole meunière. The waiter brings a whole Dover sole prepared with a butter sauce and sprinkled on top with chopped parsley. This imagery sent me seeking recipes and trying to bring my own sole meunière experience to life. First, I of course looked to the famous tome, “Mastering the Art of French Cooking,” by Julia Child, Louisette Bertholle and Simone Beck. I found a brown butter sauce recipe, other sole recipes, but no recipe for the sole meunière I craved. I’ve tinkered with different recipes, but nothing has measured up to the description of Julia’s first meal in France. These books are currently making their way to my front porch via Amazon. When they arrive I will test my cooking chops with the goal of getting to the heart and soul of Julia’s French-inspired sole. I’ll share my discoveries with recipes and cooking tips. Stay tuned for Part II of the Soul of Sole Meunière.